“Deck the halls with boughs of holly, fa-la-la-la-la, la-la-la-la-la! …or, at least that’s how the song goes. While the holidays are a time for celebration and socializing, gift-giving and indulging, for many of us they are a time for worry, anxiety, and depression. There are pressures to spend when money is tight. There are pressures to please others or to not let them down. For some, the holidays feel empty and artificial, or lonely. And still for some it is a reminder of strained family relationships or of loved ones who are no longer with us. Of course, none of our holidays (Christmas, Hanukkah, Kwanzaa, New Year’s Eve) were created to set people up to feel pressured or depressed. In fact, each holiday is inspired by, and is intended to inspire, hope. Hope is that feeling or belief that all will be well; that we can have confidence and a sense of expectation. And yet the holidays become a burden of expectations. The burden is on our time, our emotions, our wallets, and our ability to navigate the holiday pitfalls of overindulgence and guilt. And with no thanks to commercialism! We’ve come further and further away from the original intentions of commemorating the holidays and have, in many ways, been rewarded with less. 1. Get back to basics. Take a moment and reflect on the reason for celebrating the holiday. Why do you choose to celebrate it and what does it really mean for you? Whether it is a religious or nonreligious holiday, what is its central theme? If you can identify this, you’ll be able to design or select the way you want to commemorate the holiday, and stay true to yourself and the spirit of the celebration. If something doesn’t feel genuine or comfortable for you, don’t do it. Make choices that honor what is important to you. 2. Honor traditions and create new traditions. Much of what most of us remember and cherish about the holidays is centered around the traditions we have participated in from year to year. Traditions are group-oriented (family- or religion- or organization- based) and are meaningful. The best, favorite traditions are not usually expensive or gift-oriented. Lighting the menorah or Advent candles, or decorating the Christmas tree, for example, are traditions that have special significance and are directly related to their respective holidays. And it can be especially fun and meaningful to create new traditions as well. After all, traditions have to start somewhere. For a young family, a blended family, or a group of friends, a new tradition is a way to bring people together in a shared activity that will create memories and excite anticipation for future holiday celebrations. 3. 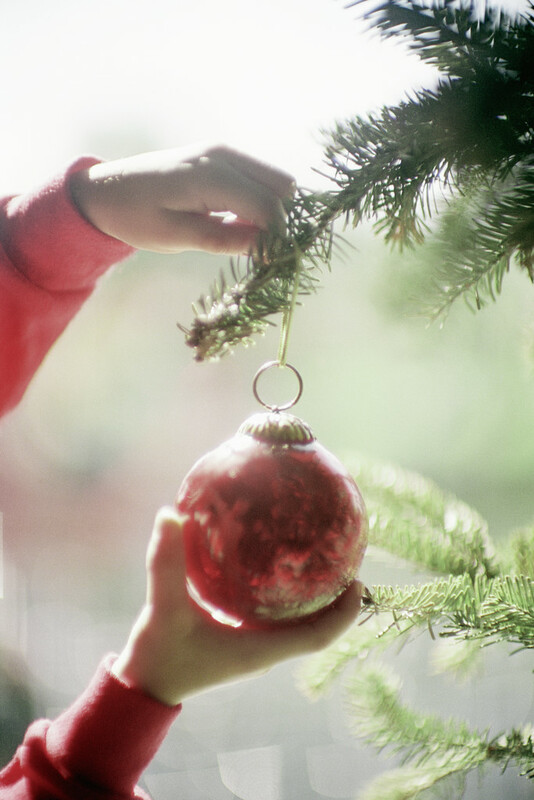 Participate in free or low-cost activities that take the focus off gifts. One of the favorite activities my husband’s church does every year is a Carol Sing. If the weather permits, the members go to the old Meetinghouse in the evening, light the wood stove that sits in the center of the room, light candles and flashlights, and sing Christmas carols together. Afterward, adults and children socialize over mulled cider, or hot chocolate, and doughnuts. Sometimes it’s a chance for young adults who’ve moved away to catch up and introduce their little ones to the Meeting. Carol Sing is a simple activity that brings people together in a warm, festive atmosphere. No bells and whistles. Nothing expensive. Just people-centered and fun. Look for community events to find an activity that catches your interest without catching your wallet. 4. Stick to your budget and find alternatives. There is so much pressure to buy and to give, that we often give in to the pressure and regret it later. Or worse – we regret it as we’re in the midst of shopping. But the holidays are not about gifts. Really. Yes, there is an aspect about giving. There is a certain spirit of giving. But the giving is not about the gift. It’s about the giving. There are lots of ways to give that do not involve putting yourself into debt and worry. Can you remember all of the gifts you have ever received? Probably a few stand out, but the majority are lost to time and memory. The simplest gifts, the gifts of your time and attention and your care, are the gifts that reveal the love in your heart and are the ones that are cherished most. One year, when my daughter was in middle school, we were living on our own in an apartment. While money was very tight, we had a roof over our heads and food on the table. We were comfortable and the bills were always paid. But there really wasn’t any extra money for Christmas. That was the fact. So I decided to do something a little different with her. I gave her $20 and myself $20. With that money, we would shop for each other at the dollar store. For $20 you can get about twenty items, which is a lot of stuff. I challenged her and myself to be thoughtful and creative in our selections. We would shop secretly from each other, making sure we couldn’t see what the other was picking up. It was like a game. After, we came home and wrapped our items in secret, and waited to put them under the tree on Christmas Eve. We teased each other with guesses about what were in the packages. We both knew that the presents I bought her would not be the only presents she would receive, as she had grandparents and aunts and uncles who would have gifts for her. Still, she was young and felt it was hard, having a dollar-store Christmas. On Christmas Day, we did laugh and marvel at what we had chosen for each other, and she learned from the experience as well. I think it was better for me to be honest with her and find an alternative, than if I had spent money that I did not have, only for her to see me worried when I could not pay the bills later. Remember, you can always find ways to show your love, because the love comes from inside you, not from a store. Finally, know that you are not alone and that December is only 31 days long. Be thoughtful in your approach to the holidays, so that they will be as you want them, and share your feelings with others. When your family or friends know your concerns, they may be more inclined to make changes to the way your group celebrates, taking some of the pressure off of you. If you keep the holidays in perspective, you will enjoy them, and yourself, a whole lot more. Best wishes for happy holidays! This really helped me! This is my first holiday season in Korea and it has been difficult for me to get into the spirit because our holidays just aren’t that big of a deal here. It feels like just another day. I am going to take your advice and get back into it! Thanks for this! I’m glad if anything I wrote helped! I was just thinking that it’s kind of interesting that while you are in Korea your experience is that the holidays are downplayed, and I am in the US and see the craziness of the holiday experience. For example, two of my favorite radio stations started playing holiday music BEFORE Thanksgiving Day. That’s too early for me. So I consciously choose to listen to something else until it gets closer to Christmas, otherwise I would get sick of it and not enjoy it. Then there’s the outrageous Black Friday holiday shopping. People have gotten hurt and have done crazy things (like pepper-spraying fellow shoppers), all in the name of getting a bargain. It’s really manic! To be honest, I haven’t even started my shopping yet. But when I do, I know I am going to stick to my (small) budget and keep it really simple. Thank you for this post! I am working on putting a similar one together and I couldn’t agree more. We have lost the reason in which we celebrate holidays. Great job on capturing that and then giving some tangible action steps. I pray you enjoy this season as it was truly meant to be enjoyed!